Studio visit by appointment only. We accept both cash and credit cards. Make an appointment with us earlier so that we can prepare some refreshments to welcome your arrival! Custom orders are priced at RM120 and RM150. 1 batch consist of 10pcs of soaps and each of them about 100g±20g and required 240~350 ml (8oz or 10oz) for 1 batch. ♥Almighty Professional Soap Making Workshop(APSPW) (全能手工皂专业课程)PRIVATE SESSION, MORE DETAILS Click HERE! ♥ Available dates:Please call us at 019-2171015 for class booking. 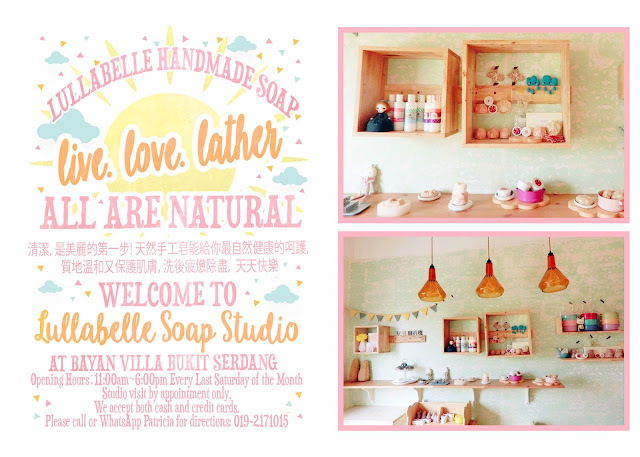 ♥♥♥Lovely Peoples Feedback to Lullabelle Handmade Soap Services & Handmade Goodies,CLICK HERE!